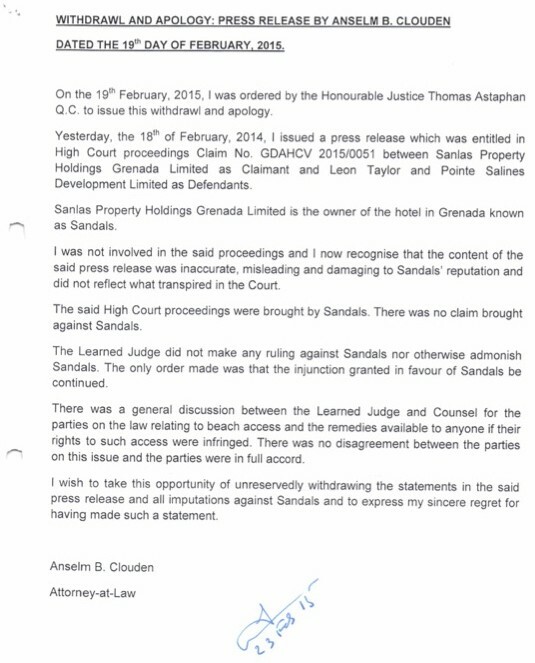 Sandals Resorts International would like to refute recent suggestions in the media which conveyed that our resort in Grenada, Sandals LaSource was involved in a process of litigation to secure a private beach. We would therefore like to state categorically that at no time were we involved in any court proceedings seeking to own a private beach. Sandals LaSource filed an injunction to bar another party from enforcing the use of private beach, subscribing to the view that all beaches in Grenada are public. We would like to state further that at no time since entering Grenada have we sought to operate a private beach and nothing could be further from the truth. In all of the nine Caribbean destinations where we have invested, we do not wish to operate a private beach. We are a Caribbean home-grown family business with the strongest appreciation for nationals to access beaches in our various destinations. We are therefore cognizant of the possibility of xenophobia that could materialize should nationals be barred access to beaches while unrestricted access is allowed to tourists. We therefore would like to encourage our media partners in Grenada to further research this matter, so that a more accurate dissemination of information to the general public can be engendered.